SANAA, Aug.8 (Saba) – The US-backed Saudi-led aggression coalition fighter jets launched series of attacks on several provinces of Yemen, which targeted residential areas, killing and injuring three civilians including a child over the past 24 hours, according to official reports combined by Saba on Wednesday. In Saada province, a citizen was injured by a Saudi-led coalition rocket and artillery shelling on the densely populated villages in Manbah, Baqim and Shada border districts, while the citizen's property were damaged, said the official. Also in Saada, four airstrikes were launched on al-Boqa'a area in Kitaf district and two on Al-Habajer area in Sahar district. 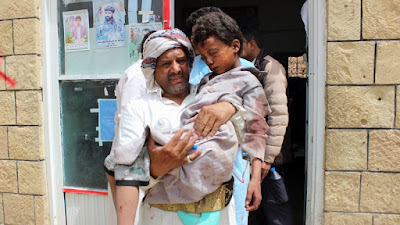 In Hodeidah province, a child was killed and a civilian was injured in an artillery shell fired by mercenaries on a farm in al-Durayhimi district and launched a raid on the farm of a citizen in the area of al-jarba in the same district. In Hodeidah, also in the coastline of al-Hawak district, the warships destroyed a building under construction near the historic castle. In Sanaa province, an airstrike targeted a citizen's farm in Shasan area in Sanhan district. In Jawf province, two airstrikes waged on al-Maslub district.